Galicia and Volhynia have, over their history, long been subject to changes of power. In the twentieth century and with the outbreak of both World Wars, this fact could not revisit itself more often. The region, home to both Poles and Ukrainians, became locked in war between the two groups as they struggled for post-war sovereignty against a sprawling Germany and Soviet Union. While these two groups have not always been on amiable terms (primarily due to the centuries-long struggle for Ukrainian independence), World War II brought any and all tensions to the forefront, and it is under these multiple occupations that a devastating civil war, and series of ethnic cleansings, were made possible. Known as the Volhynian slaughter in Polish and Volhynian tragedy in Ukrainian, the Polish-Ukrainian conflict in Galicia-Volhynia was a tense and pitiless struggle between Poles of the Home Army (AK), partisans and self-defense formations, and the Organization of Ukrainian Nationalists’ (OUN) Ukrainian Insurgent Army (UPA). Some scholars ascribing to certain national narratives, however, fail to realize the scale and reciprocal nature of the conflict from beginning to end, even though both sides struggled for identical goals through identical means. This period was not limited to a single campaign of ethnic cleansing, but rather an ongoing chain reaction of cleansings that began and culminated under the auspices of multiple occupational regimes actively seeking to provoke and maintain this state of chaos. By looking at the events that took place as part of an extended continuum with multiple actors, and not as an isolated or one-sided event that spanned only a handful of years, we can better understand both the causation that led to and perpetuated this conflict, as well as the true gravity of events that unfolded for both sides. The ethnic cleansing that occurred between Poles and their Ukrainian neighbors cannot be simplified or viewed as an isolated, sporadic, or one-sided event that occurred without precedent, evocation, or meaning. Even within the contemporary framework of it occurring as a byproduct of their mutual civil war, to fully understand the causal relationship that set these events in motion, one must place this civil conflict within the context of the World War that it paralleled. The instability of Galicia-Volhynia and the bordering region in general, can most easily be explained by its geographical misfortune of enduring a “triple occupation” that occurred in four successive waves. The first of these occupational waves took place in the aftermath of the First World War. The attempted creation of nation-states in Poland and Ukraine carried with them the same transitional issues similarly situated European states endured. In this transition away from an agrarian to a modern polity, cross-border friction over land ownership was only made worse by the authoritative policies of the Polish state at the time. With the newly reformed Polish state no longer imperial in design, ethnic cleavages were especially pronounced in the voivodships (provinces) within Galicia and Volhynia where the Polish elite continued to rule as a minority of the population. On a local level, first hand reports cite the killing of Ukrainians along the San River. On an official level, Poles ruled heavy-handedly from 1920-39. In defiance of the League of Nations and its attempt to demarcate a border between two ethnic groups (known as the Curzon Line) Poland occupied and proceeded to divide Ukrainian lands with the Soviet Union. Ukrainians considered Polish occupation to be thrust upon them, whereas Poles considered western Ukrainian lands to be a necessary possession for state security. British commentary on government policy exclaimed that persecution provided Ukrainians with an “added consciousness and solidarity” and that Polish severity actually “increased the insecurity of the south-eastern frontier of the republic.” The Polish narrative tends to ignore the behavior and consequences of its interwar government. It should have come as no surprise, though, that the repressive policies of Jozef Pilsudski and the Polish colonization of Ukrainian territory fostered the growth of later Ukrainian insurgency. Soviet occupation spawned even more hatred among the Ukrainian population, radicalizing it. The second wave of occupation occurred in 1939 following the Soviet invasion of Poland. Already a region conducive to violent inter-ethnic conflict, the San now acted as the boundary between the zones established by the Soviets and Nazi Germany. Following the division of Poland, “everything changed.” Massive, state-organized political and ethnic violence carried out by both parties introduced a divided Poland to its first exposure of massive ethnic cleansing. From 1939 to 1941, “an unprecedented terror swept the recently conquered areas of Western Ukraine.” For Poles, tens of thousands were killed and hundreds of thousands were deported by both occupational regimes – Ukrainians also suffered immensely. Soviet occupation is said to have “decapitated” Polish and Ukrainian society, in which Galicia especially was completely torn apart. The mass devastation notwithstanding, Soviet occupation spawned even more hatred among the Ukrainian population, radicalizing it. The third wave, that in which Nazi Germany occupied Galicia and Volhynia, was the most decisive in converting these pent up frustrations into fully realized ethnic cleansing. While inter-ethnic violence between Poles and Ukrainians had been longstanding, Nazi occupation had a clear cause and effect, with massacres beginning as early as 1941. Under this new occupation the San River no longer acted as an important boundary. Instead, Volhynia was placed under the administration of the Nazi German colony called the Reichskommissariat Ukraine, and Galicia within the Generalgouvernment, which was part of Greater Germany itself. New social and political divisions were established in a short period: in Galicia, Ukrainians were elevated to positions of authority whereas in Volhynia, Poles retained authority within the German administration. Volhynia faced a harsher occupation in general, and due to its northern location, quickly became a battleground for Soviet partisans. Volhynian society was reduced to chaos by 1943. Hitler’s genocidal policy to exterminate Europe’s Jewish population, the Final Solution, began in 1942, but prior to this the population was already well exposed to an immense population displacement enforced by the Germans. Meanwhile, from Soviet Ukraine, propaganda promoted the possibility of a free and united “great Ukrainian people,” one that included Galicia and its crown jewel, Lviv. On the whole, the precedent for ethnic cleansing and the popularity of fascist and Bolshevik nationalism made perfect ingredients for what remained of a devastated society to reciprocate the words and actions of the newly imposed authority. As the Soviet and German armies waged war on one another for control of Eastern Europe, the Polish-Ukrainian civil war continued to be fought for sovereignty over land that neither side still controlled. Nonetheless, claims were made whose terms were unnegotiable: politically active Poles wanted to restore the 1939 borders whereas Ukrainians called for primacy over their own ethnic territory. Ukrainian concerns of Polish intentions were not unfounded, and with the question of legitimate rule over Galicia-Volhynia reopened, political proposals had already been made to deport up to 500,000 Ukrainians from an imagined ‘post-war Poland with pre-war frontiers’. Dmowski’s National Democrats went as far as desiring the entire expulsion of Ukrainians from the Polish state. Talks that did take place were fruitless, as was the case in Lviv of 1942 between the OUN and Polish government-in-exile, the latter of which insisted Volhynia was a “mixed territory.” While some historians contest the legitimacy of Polish claims to these lands, Poles had indeed lived on these lands for centuries; Volhynia alone had a pre-war presence of 400,000. The rejection of Polish land rights was not a view held among the radicalized; even moderate Ukrainians failed to see any legitimacy in Poland’s aspirations. However, the radical among the OUN were passionately determined to prevent the clock from being rolled back and instead wanted to revisit attempts to begin a Ukrainian nation-state. This was a difficult proposal, though, because the creation of states is harder to accomplish than the restoration of states. To expedite the process and acquire legitimacy among its population, ethnic cleansing was seen in this instance as a distinct political answer. In determining where, when, and how the conflict began and who threw the first stone, Polish and Ukrainian views differ greatly. Some Ukrainians are of the opinion that the conflict began with the killing of Ukrainian underground soldiers and activists by the Polish underground, who considered them German collaborators. Others reject this notion and claim that the killings began as an OUN initiative, unrelated to the prior actions of the Home Army. Another claim is that the Ukrainians of Volhynia turned on the Poles after Polish Soviet partisans arrived in region, singling out the Ukrainian population. German and Soviet authorities actively pursued a policy of provocation to pit the two sides, Polish and Ukrainian, against each other in order to divide and conquer. These provocations proved to be extremely successful, but how did they result in such widespread violence between both societies? The simple answer is that the attrition of war wore down both sides to such an extent that ethnic cleansing could not be prevented. A complete breakdown of governance and justice essentially decapitated civil and local society, leaving both sides to rely on their respective underground military organizations as the only source of authority. The Ukrainian organization in particular by 1943 was left only with its youngest and most radical supporters. The Ukrainian Insurgent Army’s program of ethnic cleansing began in earnest in March 1943, but sporadic killings had already started through the fall of 1942; the earliest accounts being in the Sarny region of Volyn and continuing throughout the winter. Since Ukrainian police held a more significant role in Volhynia than Galicia, this made for an explosive situation when in March 1943, Ukrainians abandoned their roles in the German police, taking with them their weapons and firsthand experience in implementing German atrocities. The UPA’s forces in Volhynia would reach as many as 20,000 troops; however, approximately ninety percent of the UPA’s attacks would collectively take place in the Galician provinces of Stanislaviv, Drohobych, Ternopil, and Lviv. The majority of the UPA’s attacks in Volhynia aimed at cleansing the region occurred throughout March-April, July-August, then in tailed off by late December of that year. Many victims included innocent Polish civilians, but some analysis has shown that main targets still included AK and partisan formations, indicating that the UPA’s presence was not limited to punitive actions against ethnic Poles but also retained its military purpose in this war. The goal of the OUN was not to exterminate each and every Pole, but rather to swiftly and brutally enforce the resettlement of all Poles to the west of the Curzon Line, preventing any future possibility of claims toward the territory being “mixed.” In addition to Poles, factionalism within the OUN caused Ukrainian insurgents to kill tens of thousands of Ukrainians for siding with either the Melnyk or Borovets factions. Ukrainians who converted to Roman Catholicism were also killed. By January 1944 the war had spread to Galicia but demographic conditions favoring Poles likely caused a reduction in the violence. Polish families, unlike in Volhynia, were presented a warning with the option of flight. Notices left on doors of Polish residences in Galicia stated the rationale behind their actions: “Because the Polish government and Polish people collaborate with the Bolsheviks and are bent on destroying the Ukrainian people on their own land, [name] is hereby called upon to move to native Polish soil…” Ethnic cleansing by the UPA was highly political in nature, and in addition to Poles and Melnykite Ukrainians, the course of the war tallied an estimate of 22 thousand pro-Soviet Ukrainian civilian losses at the hands of the UPA. By the spring of 1945, the UPA and AK had come to a truce, but conflict between Ukrainians and Soviet and pro-Communist Polish forces continued. Even prior to the “official” outbreak of ethnic cleansing by Ukrainians, massacres aimed at the Ukrainian population of Kholm had started as early as 1942. Historians in the Ukrainian diaspora focus on the Polish “retaliatory” actions that occurred during this conflict, and rightly so. Much like the preemptive nature of the Ukrainian attacks in Volhynia, as early as 1941 Poles equated war with Germany to war with Ukrainians for Galicia-Volhynia, and sought to achieve a quick “armed occupation.” In order to carry out retaliatory actions against Ukrainian aggressors, Polish partisans created self-defense formations. Retaliation, however, was carried out inch for inch, and was ‘hardly less fierce’. Warnings to Ukrainians made in 1943 stated that every village burned would result in two Ukrainian villages being razed, and for every Pole killed, two Ukrainians would be killed in his place immediately. Orders issued in February of 1944 by Polish Home Army commander Lt. Kazimierz Babinski said only children would be spared; however, a month later a massacre by Polish partisans occurred in Kholm killing 1,500, of whom 70% were women and children. The largest groups (namely the Wiklina, Kozaka, Korczaka detachments of the Polish Home Army) played a considerable role, cleansing the Ukrainian population from Kowal, Wlodzimierz, and Lubomel in 1943-44. By the middle of 1944 the feeling of many Poles was that they would still retake or even extend territory into Ukraine. That summer approximately 150 villages, home to 15,000 Ukrainians, had been razed in so-called retaliatory measures. Attacks aimed at eliminating civilian populations were not uncommon from the Polish side. Even prior to the “official” outbreak of ethnic cleansing by Ukrainians, massacres aimed at the Ukrainian population of Kholm had started as early as 1942. Often, even when no direct orders from the Polish government-in-exile were given, this had no bearing on impeding retaliatory measures, causing Ukrainians civilians in many cases to be killed indiscriminately and on sight. Retaliation also took place by proxy, whereby upon hearing new of killings in Volhynia, for instance, Poles in Galicia would take up arms against local Ukrainians. Members of the Polish 27th Home Army Infantry Division, created from from former Polish policemen to fight the UPA who had, like many in the UPA, deserted German service. Following the German retreat, Poles ethnically cleansed their environs to an even greater degree, spreading from neighboring villages to isolated settlements. By late 1945 and into 1946, the modus operandi of the Polish Army was to attack UPA units in order to justify attacking Ukrainian settlements, wait for Ukrainian retaliation, and use that as further justification for “retaliation.” These methods were cyclical, and clearly illustrate the reciprocal nature of this conflict. A multidimensional conflict, Polish retaliation and instigation took several forms: fighting Ukrainians as German policemen, NKVD battalions, Soviet partisans, and as self-defense militias and members of the Home Army. From 1944-47, during the final occupational wave in the region, Soviet forces in collaboration with local Polish communists enacted a broad and final act of ethnic cleansing to end the conflict once and for all. Much like the original goals proposed by Polish and Ukrainian leaders, Soviet-mandated ethnic cleansing was used as a means to an end with violence utilized to solidify and legitimize state control. Polish veteran officers who had served as partisans during the Second World War were unsympathetic, and like the UPA in 1943, they knew that the war would only be won by “drastic measures.” Ultimately, both Ukrainians and Poles were purged of their land on a staggering scale. In order to solve this “Ukrainian problem,” a series of deportations and forced relocations, named Operation Vistula, acted as a direct successor of, and brought an end to, the ‘ethnic redefinition’ of Poland and Ukraine as states virtually homogenous in their ethnic composition. The goal of each side was finally, painstakingly, actualized. Figures of the conflict are largely a contested matter requiring further impartial research due to current estimates being far from narrowed or consistent. Polish scholars have evidenced 34,647 deaths to date, and as a general rule, cumulative deaths in Volhynia range from 35 thousand on the low end, but can go as high as double that or more; most reasonable estimates cap at the 50-60 thousand range, however. Totals from Galicia go as low as 10 and high as 25 thousand; and Lublin and Rezeszow 5 thousand (which equaled Ukainian deaths by Poles). Part of this discrepancy is likely due to Polish historians inflating figures, and another reason is due to a lack of accounting for deportations and executions that occurred during this triple-occupation. For this latter reason, Ivan Katchanovski believes the lower bound of the Volhynian figure to be more accurate. Ukrainian deaths from this period of ethnic cleansing are also estimated to be as high as 30 thousand in Ukraine. In Poland, 11 thousand Ukrainians are said to have been killed, exceeding the 7 thousand Poles who perished there as well. All said, when comparing the most modest of findings, over 50 thousand Polish in comparison to a rough excess of 40 thousand Ukrainian casualties (and recalling the tens of thousands of additional Ukrainians who were killed in intra-ethnic violence), further illustrates the mutually exhaustive nature ethnic cleansing was for both sides in this conflict. Both sides were positioned, motivated, and subsequently suffered in a relatively equal manner during the events that took place in Galicia-Volhynia. What may have begun as a series of sporadic clashes was provoked and focused into an exhaustive ethnic cleansing campaign that not only brought upon itself retaliation, but reciprocation. The Ukrainian campaign was especially brutal in its earliest months but as time wore on the Polish response made for substantial losses on both sides. Presented to be a force that acted in retaliation, in reality, the Polish forces are equally as guilty as the Ukrainian for aggression in the battle to stake the post-war claim to Galicia and Volhynia. Taking place in the heart of the eastern front, the actions of both Nazi and Soviet genocide and ethnic cleansing transferred to the local levels, and continued well beyond the end of the war. What began as two states trying to carve out their very own legitimate nation states in the face of losing what they once had, in the end resulted in neither attaining their wish. Today in Odesa to celebrate Constitution Day, thousands gathered on the Potemkin Stairs to unveil a massive Ukrainian flag in support of the military in eastern Ukraine. The city celebrated the 18th anniversary of the Constitution of Ukraine, and as part of the festivities a wreath and flower laying ceremony took place at the Taras Shevchenko memorial. The event was intentionally apolitical, and those attending were told only to bring flags of Ukraine without any political slogans. The ceremony was attended by representatives of the city of Odesa and Odesa region, military, veterans, and the public. “The Ukrainian nationalists stepped on the private territory illegally. Specifically, they entered the school, where children were staying. This suggests that the Ukrainian nationalists do not comply with the laws, nor do they care about the safety of children. A children’s school is not a place for political protests,” Russian activists wrote in an appeal of the incident. The actual story, however, paints a clear picture of what would have otherwise been a bizarre form of protest. According to the Ukrainian community activists, the group intended to protest Russian military aggression and the death of 49 servicemen in Luhansk by intercepting the representative of the Consulate General of Russia who, according to the Consulate’s website, was to be on location for passport renewals of Russian citizens. The Consulate’s website did not state that the venue, located at a public shopping mall, doubled as a Sunday school. With the school year being over, no children were actually present at the location: only those adults waiting for passports. Omitted from reports were also the group’s large “Bloody killer” poster displaying a graphic of Vladimir Putin, as well as photographs displaying Ukrainian victims killed servicemen of the ongoing war with Russia. The full update and rest of the story can be read here. Vladimir Putin’s options in Ukraine appear to be diminishing as the war in the Donbas continues, despite an official ceasefire initiated on June 20 by Ukraine’s new president, Petro Poroshenko. After almost four months of conflict, which began on March 1, when Russian forces occupied Crimea, the impetus for further dramatic changes in revising territorial boundaries in Ukraine has slowed notably. A survey conducted by the fund Public Opinion, reveals that today over 50% of Russians want Putin to run for president of Russia after 2018, when his current term expires. The survey points out that the increase in the president’s popularity stems directly from the annexation of Crimea. The direct costs to date have been serious without being dangerous. Ukraine refers to the situation as one of “temporary occupation.” The UN resolution on March 27, which stated that the Crimean Referendum “cannot be the basis for any changes of status” of the peninsula, received the support of 100 member countries out of 193, with 11 opposed, and 58 abstentions. The costs of the occupation will likely prove severe in future (up to 1 trillion rubles over four years), and building the bridge over the Kerch Straits alone will amount to R283-349 billion—around $8.3-$10.3 billion. These future impositions will eventually take a toll on the Russian economy, but may not affect Putin’s popularity for the immediate future. But if Crimea has necessitated acceptable sacrifices, the situation in Eastern Ukraine has been more problematic from Moscow’s perspective. Despite intensive propaganda directed at local residents, there is little to suggest that the local population supports the Donetsk People’s Republic (DNR) or the Luhansk People’s Republic (LNR). Moreover, while nebulous concerning details, Poroshenko’s peace plan has acknowledged the need for decentralization of authority to the benefit of these regions. On the basis of a new Constitution, he declared, new local councils will be elected and form executive committees, which elect their own leaders. The proposed amendments would allow regions wide rights in the spheres of historical memory, cultural traditions, and language policy, and local communities in the Donbas will enjoy the right to use Russian, along with the state language (Ukrainian). The president also added that the program would create new jobs in the region with the assistance of the EU, but no investments would be forthcoming until warfare ended. Poroshenko is willing to talk to those who joined the separatists, but not those involved in acts of terrorism, murder, or torture. Putin showed some signs of willingness to support the ceasefire, requesting the Federation Council to withdraw the resolution permitting military intervention in Ukraine. Valery Bolotov, head of separatist military forces in Luhansk and Aleksandr Khodakovsky, commander of the Vostok battalion, both took part in the press conference in support of the ceasefire, which was to expire on June 27. Three former presidents of Ukraine, Leonid Kuchma (he has been Poroshenko’s designated mediator in discussions with Russia), Leonid Kravchuk, and Viktor Yushchenko had earlier sent an open letter to Putin, demanding that he end aggression against Ukraine and start negotiations. Kravchuk remarked that without Putin, no peace proposals implemented by the Ukrainian side could be implemented. On June 22, Putin made a conciliatory statement on the need for a compromise acceptable to all sides, including the people of south-east Ukraine “who should feel they are an integral part of this country,” which taken literally would imply that the Russian president no longer recognizes the authority of the separatist regimes. The difficulties, however, lie at the heart of these quasi-regimes and their self-appointed leaders. The “people’s governor” of Donetsk Oblast, Pavel Gubarev, proposed his own plan to resolve the conflict in southeastern Ukraine, which he posted on his Facebook page. It demanded that all Ukrainian troops be removed from the two breakaway republics and Kyiv should recognize their legitimacy, as well as the creation of conditions for a referendum in other regions of “Novorossiya.” He also stated that Ihor Kolomoiskyi (governor of Dnipropetrovsk), Arsen Avakov (Ukraine’s Minister of Internal Affairs), and Oleh Lyashko (leader of the Ukrainian Radical Party) must voluntarily give themselves up to the militia, while oligarch Rinat Akhmetov must return everything he has “stolen from the people,” gather his belongings, and leave the country. On June 21, at Lenin Square in Donetsk (i.e. the day after the ceasefire was introduced), the armed forces of the breakaway regions took an oath of loyalty, attended by “Prime Minister” Aleksandr Boroday, former MP Oleh Tsarev, and the head of the Novorossiya party, Gubarev. These are hardly the actions of people in a mood for compromise. The same can be said of the head of the armed forces of the DNR, Igor Strelkov (Girkin), who stated in an interview with LifeNews on June 25 that he was prepared to observe a ceasefire only on three conditions. First, that the Ukrainian army should move 10 kilometers from the main army garrisons of the DNR and LNR; second, flights of Ukrainian military planes over zones controlled by rebels must stop; and third, artillery fire on settlements and separatist bases must end. While Strelkov has declared his gratitude to Russia for the provision of weapons, which have undoubtedly been used at his base on Slovyansk (resulting in the deaths of 49 military personnel after the shooting down of a Ukrainian plane in mid-June), his frustration with his ostensible masters in Moscow has been evident for some time. Further, the demands of both Strelkov and Gubarev are far-fetched in a situation where the Ukrainian president would prefer not to deal directly with those who wish to break up or challenge the territorial integrity of his country. Russian opposition politician Boris Nemtsov maintains that Putin has betrayed the Russian mercenaries, who went to Ukraine brainwashed by propaganda. He points out that “Putin’s channels” (on Russian television) talk constantly about the heroic fight against “Fascists and Banderites” but they do not show Strelkov. The latter had been among the first to be obsessed with the anti-Ukrainian propaganda and had taken up guns and traveled to Slovyansk. His example was followed by hundreds of fighters from Russia, who became the backbone of resistance to the Ukrainian army. But whereas all television propaganda focused on Strelkov’s armed detachments, the leader himself was kept in the shadows. Nemtsov’s theory is that after the war, Strelkov and his companions will return to Russia incensed at Putin for his betrayal of them, and their next actions will not be in Slovyansk, but in Moscow. The implication is that they would want Putin removed from power for inciting them to action and then withdrawing support. Nemtsov’s analysis, while perhaps overblown, nonetheless delves into the heart of the dilemmas facing Vladimir Putin. He gained a surge of popularity for the successful annexation of Crimea, but the intervention in Eastern Ukraine—the concept of the so-called “Novorossiya”—has run into serious difficulties and cannot be sustained without a full-scale Russian military invasion. In one operation alone, Ukraine’s anti-terrorist forces killed over 250 separatists, and while costly in terms of casualties and impact on the local population, the sustained, if error-strewn drive in place since Poroshenko’s inauguration has effectively ended prospects of separatist victory assuming the current array of forces is maintained. In that respect the ceasefire may have been somewhat premature. For Putin, however, a desperate situation is masked behind what seem to be “peace maneuvers.” In reality, without further escalation, the Russian leader will lose control over the forces he has created. In this respect, Putin’s fatal mistake was less his encouragement of the likes of Strelkov, and rather his intervention into Crimea on March 1, which at one stroke changed a border in place for sixty years. At present none of these events seems to pose an immediate danger to the Russian president, but he is wise enough to recognize that his position is deteriorating. His actions have incurred human losses, great expenses, the alienation of much of the international community, and the lasting enmity of the vast majority of Ukrainians, all of which he might have been prepared to sustain if the result had been the end of Ukraine’s move toward the West or the self-rule or independence of its eastern territories. 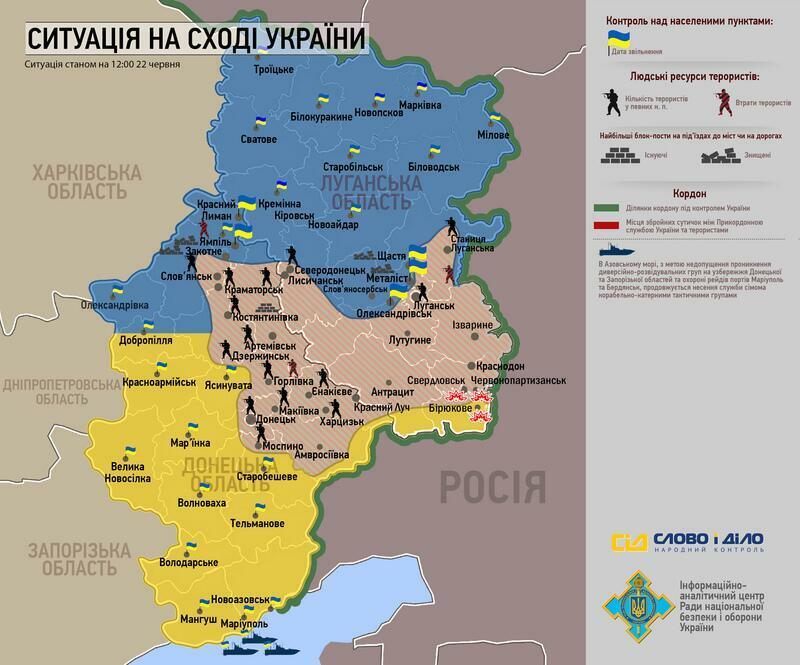 But none of this has happened, and separatists in Slovyansk, Kramatorsk, and other Donbas towns are now in peril. They cannot agree to a ceasefire because it will signify the end of their mission and the Russian leader seems to have abandoned them. In turn, Putin has no wish to initiate full-scale war and face the quagmire of another Afghanistan. If he deluded himself into the view that he would receive widespread support in Eastern Ukraine, he recognizes today that any major conflict would be protracted and costly. His actions on March 1 are now coming back to haunt him. The DPR and LPR and legally classified as terrorist organizations in Ukraine. Terrorist organizations declare New Russian "Union of People's Republics"
Author M BabiakPosted on June 24, 2014 Categories War in the DonbasTags Donetsk, Luhansk, New Russia, Terrorism1 Comment on Terrorist organizations declare New Russian "Union of People's Republics"
Evidence over the past several days illustrating the motivations behind Russian insurgents in eastern Ukraine has been mounting. While some have, indeed, been driven by revanchist ideology (with one famously telling TIME that they were simply conquering “historically Russian lands”), the source of these groups’ financing has been more difficult to trace than the source of their weapons in lieu of a paper trail. This week has, however, seen three illuminating examples of the financial motivations of those recruited. He was a mechanic by training who had a job in some friends’ computer repair shop as a delivery man until they were unable to pay him. His wife speculated that perhaps his shortage of funds could have pushed him into volunteering for Donetsk, although he didn’t speak of it. Two days later the Security Service of Ukraine (SBU) published a video confession of a mercenary claiming to have been contracted by Russia’s KGB successor agency – the Federal Security Service (FSB). The man in the confessional says he was acting on a $1,000 bounty for every Ukrainian officer killed (and $300 for soldiers). All of this precedes today’s other revelation that Russia has been actively attempting to recruit mercenary veterans of the French Foreign Legion, targeting especially those of Slavic ethnic origin. The Russian military has in recent years opened its recruitment scope to foreigners with the lure of acquiring fast tracked citizenship. While the number of professional, heavily armed Russian soldiers mounts in Ukraine, so too is the evidence behind the financial motivations of those fighting there – shaping the war to be less a result of ad hoc extremism, but instead rather that of a state-financed proxy war. U.S. Intelligence: Russian tanks "sent from Russia to Ukraine"
During the U.S. State Department’s press briefing, deputy spokesperson Marie Harf dismissed earlier reports that insurgent-piloted tanks in the Donetsk region were of Ukrainian military origin. Rather, she elaborated that intelligence has provided convincing evidence that Donetsk militants acquired heavy weapons and military equipment from Russia, including Russian tanks. “They were somehow pulled out of the Russian warehouses, someone taught them how to use them, and they were sent from Russia to Ukraine,” Harf flatly explained. Militants had thus far admitted they acquired the units “from a military warehouse” but without elaborating further. Unlike past acquisitions of weaponized vehicles which have been readily shown off to news agencies and crowds alike, these militants instead shied away from any bravado, anxiously warning Reuters journalists against capturing any photography of the acquired tanks. Author M BabiakPosted on June 14, 2014 Categories NewsTags Donetsk, Russia1 Comment on U.S. Intelligence: Russian tanks "sent from Russia to Ukraine"